The Telegraph is reporting Sharp US money supply contraction points to Wall Street crunch ahead. The US money supply has experienced the sharpest contraction in modern history, heightening the risk of a Wall Street crunch and a severe economic slowdown in coming months. Data compiled by Lombard Street Research shows that the M3 ''broad money" aggregates fell by almost $50bn (£26.8bn) in July, the biggest one-month fall since modern records began in 1959. "Monthly data for July show that the broad money growth has almost collapsed," said Gabriel Stein, the group's leading monetary economist. On a three-month basis, the M3 growth rate has fallen from almost 19pc earlier this year to just 2.1pc (annualised) for the period from May to July. This is below the rate of inflation, implying a shrinkage in real terms. The growth in bank loans has turned negative to a halt since March. "It's obviously worrying. People either can't borrow, or don't want to borrow even if they can," said Mr Stein. My Comment: What would be more worrying would be if banks kept lending in a world where asset prices are plunging. Those with good credit do not want to borrow and those with bad credit can't borrow. This is actually a good development. Banks need to raise capital, as opposed to lending recklessly in a word of overcapacity in nearly everything. Monetarists say it is the sharpness of the drop that is most disturbing, rather than the absolute level. Moves of this speed are extremely rare. My Comment: Stein and others have this backwards. The drop is not or rather should not be disturbing. Nor should it have been unexpected. The reason a huge plunge was expected by me has to do with why M3 was soaring in the first place. M3 was soaring because institutions and consumers were telling credit lines and parking the money in money market funds. Those screaming inflation, or hyperinflation missed the boat on this big time. Now that those credit lines have been tapped or shut off, it is perfectly logical to see M3 plunge. The overall debt burden in the US economy is currently at record levels, raising concerns that a recession - if it occurs - could set off a sharp downward spiral. My Comment: A recession is here, and at this point it is silly to assume otherwise. Monetarists insist that shifts in M3 are a lead indicator of asset prices moves, typically six months or so ahead. If so, the latest collapse points to a grim autumn for Wall Street and for the American property market. As a rule of thumb, the data gives a one-year advance signal on economic growth, and a two-year signal on future inflation. My Comment: M3 has proven to be a poor leading indicator. Housing has been crashing for three years, equity prices in general have been sinking for 9 months and financials have been sinking like a rock for a year. The US recession started in December of 2007 or January of 2008, some 8-9 months ago. Pray tell what about M3 is leading? M3 surged after the onset of the credit crunch, but this was chiefly a distortion caused by the near total paralysis in parts of the American commercial paper market. Borrowers were forced to take out bank loans instead. The commercial paper market has yet to recover. My Comment: I have been talking about this all year. The bottom line is that one has to look not only at what M3 is doing, but why it is doing it. Nearly everyone got this wrong. Please see MZM, M3 Show Flight to Safety for more details. 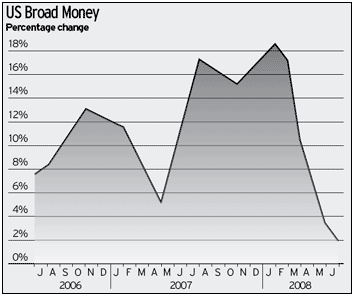 Please see TMS: A Truer Money Supply? for a discussion of a far better monetary aggregate to watch than M3. Here is a snip from the latter. People are failing to take into consideration why M3 is soaring. And right now the why is extremely important. The answer is businesses are tapping credit lines for fear they cannot tap them later. They are parking that money in institutional money market accounts and in response M3 and MZM have been soaring. These certainly are not inflationary conditions. What cannot go on indeed has not gone on. Deflation is here even as misguided screams of inflation from those looking in the rear view mirror are now echoing around the world. On August 10th I wrote The Future Is Frugality. I will add to that The Future Is Now.